Nordinor is a skooma dealer who lives at The Fair Deal in Bravil. He is also one of only two vendors who sell skooma in Cyrodiil, the other being Shady Sam. Faelian will direct you to him if you don't have any skooma during The Lonely Wanderer quest. Nordinor wakes up at 9am and immediately leaves The Fair Deal to head toward the Lonely Suitor Lodge for a five-hour meal. At 2pm he will leave the Lonely Suitor Lodge to head back to The Fair Deal, where he will stay inside until midnight. He will then head to the adjoining alley beside The Fair Deal, offering his services until 4am. He will then head into The Fair Deal to sleep. He wears lower class clothing consisting of a dark green shirt, laced leather pants, and stitched leather shoes. He carries the key to The Fair Deal and a small amount of gold. During the related quest, if you tell Faelian that you do not have any skooma, he will tell you to visit Nordinor in order to buy some: "Oh... okay. Well... You get me some skooma, and then we'll... be good friends. Okay? Okay... Nordinor.. In Bravil... 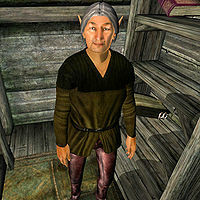 He sells it... Late at night..." Similarly, if you lie to Faelian and tell him you have some skooma when you currently do not possess any, he will be somewhat upset that you lied and will then point you toward Nordinor: "Wait... You... You lied! Ohh... That's mean! Nordinor.. In Bravil... He sells skooma! Late at night... Go get me some... Okay?" When the quests that are related to Bravil are all completed, Nordinor eventually becomes the only essential character in Bravil, with the exception of the Night Mother.